I recently spent another lovely week in Cornwall. I wanted to be near the sea while still being near Truro for my hubby’s regular dialysis sessions, so I opted for a cottage in St Agnes. St Agnes is a beautiful, unspoilt little town on the North Cornwall coast. It is full of fascinating relics from the days when tin and copper mining was the main industry. It seemed strange to me to see derelict tin mines visible from behind houses and forming the boundary walls of gardens. In fact tin is still produced in St Agnes at the Blue Hills Mine, the only place in the UK that still produces it. St Agnes is an area of outstanding natural beauty and it has been designated a World Heritage Site. I can certainly see why. I just loved the rugged land and seascapes. Even in our state of unfitness we were able to walk some of the coastal path. This leads to sights that can never be appreciated from the road. 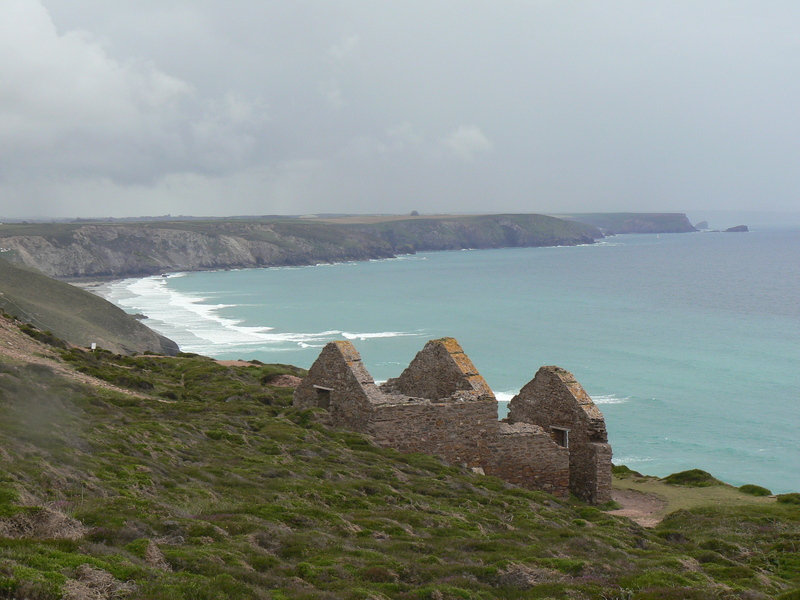 One of these is Wheal Coates Mine. It is truly amazing when seen from a distance with its three shafts and its spectacular position on the side of the cliffs. In fact the mine goes all the way down to the sea and at high tide you can hear the waves crashing against rocks through a grid in the ruins. It was possible to get into this mine via a large cave at a nearby beach. There is a local legend that says Wheal Coates is haunted by the spirits of the miners who died there. I expect the eerie sounds of the sea account for the legends. I’ve always been interested in industrial buildings. I guess this is mainly due to my father’s influence as he was a steel man from the age of 13 and he developed in me a passion for ships, bridges and buildings. The other reason could be because of where I grew up. I lived in the Felling, a shipbuilding and mining area in the North of England. I skipped past the railway station and shipyard every day on my way to school and there was a derelict engine house complete with winding gear at the end of our street of 2 up and 2 down back to back miners’ cottages. These were our adventure playgrounds. Children were never allowed to play on the grass or ride bikes in the municipal parks in those days! Parks were for floral displays and grown-ups to walk in and the park warden was fierce. Around St Agnes there are beaches, bays and coves with caves where wreckers and smugglers, no doubt, once hid their treasures. We visited a pub reminiscent of Jamaica Inn. The pub is called the Driftwood and it has a fascinating history. It is a 17th century building which in its time has been a warehouse for the tin mines, a ships’ chandlery, and a sail maker’s loft, before becoming a characterful old pub. It is built of Cornish stone and slate and ship’s timbers and spares. Behind one of the fireplaces in the pub there is a tunnel which was uncovered during restoration. It is said that this was the secret escape route for the wreckers and smugglers of the area as it leads all the way to the beach. The cottage we stayed in was perfect and my joy was complete when my daughter came to stay for a couple of days with my adorable grandson. He just loved the sea and sand, the horses in the paddock and the trampoline in the garden. We took him to Lappa Valley Railway, which is kiddie heaven in my book. Built on the site of yet another ruined mine, there are castles and treehouses and adventure equipment to satisfy any age. There are also 12 steam engines giving rides on trains which Stanley really loved. There is also a boating lake, café, shop and everything you could want for a fun day out. I loved it. Sadly it will be another year before I can go away again due to the shortage of holiday dialysis spaces around the country. But until then I have my photos to remind me of the fun we had and the beauty of Cornwall. Enjoy! I am so thrilled to be going back to Cornwall for a holiday this year. A holiday and travel in general is a rare treat since my hubby started dialysis some years ago. We can only go to an area with a hospital that offers holiday dialysis ~ and has a vacant week. Twice we have been fortunate enough to get holidays in Dorset and I have written about those before. Last year we travelled to Truro where the general hospital also offers holiday dialysis. Having never explored Cornwall I had great plans of all the places I wanted to see. But my hopes were firmly dashed when the car broke down before we even got to our hotel! Now I’m confined to my hotel! I did manage to visit some tin mines, the Lost Gardens of Heligan and the Minack Theatre once my car was fixed, and you can see photos of them by clicking their links. 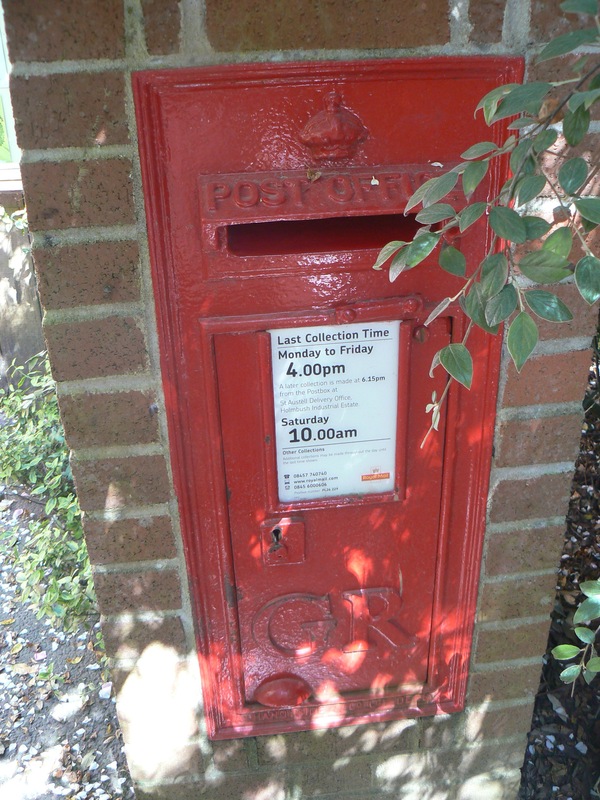 Original George V postbox at Lost Gardens of Heligan. I recently wrote about the mysterious Church of Ampney St Mary which had been covered in ivy and lost for years until it was rediscovered in 1913. Today I visited an equally mysterious garden in Cornwall which had been lost in undergrowth and weed for over 75 years until it was rediscovered quite by accident in 1990. Heligan had been the seat of the Tremayne family since the 16th Century and was surrounded by fabulous gardens which had been designed and added to by successive members of the family. At the beginning of the 20th century there were 22 full time gardeners looking after the estate. But in 1914 when war broke out they all had to go away to fight. Before leaving one of the gardeners scratched a puzzling message into a wall saying, “Don’t come here to sleep or slumber…”. Under the message were the names of the workers and the date August 1914. 16 of the 22 gardeners were killed in the war and the fortunes of the Tremayne family home were altered for ever. During the First World War Britain suffered a terrible decline in its social and economic structures. Many large estates were broken up including Heligan. The house itself was rented out and the gardens became overgrown through neglect until they all but disappeared. That could have been the end of the story but John Willis, who is a descendent of the Tremayne family who lived in the area visited Heligan with some friends. While exploring he found a tiny room buried under fallen masonry and there on a wall he found the gardener’s sad message. It captured his imagination and along with his friends he decided to restore the gardens to their former glory in memory, not of the great people who had owned the estate, but of the great gardeners who had worked on it. And so the amazing restoration of the Lost Gardens of Heligan began. It is an ongoing project but the gardens today were magnificent. My favourite bits are the Crystal Grotto, the flower garden and the jungle. My favourite plant was the tree fern. But the whole place is enchanting, atmospheric, mysterious and inspirational. I saw lots of wildlife and half expected to see fairies dancing in the woods! Do enjoy the photos I took today in the flower garden and take a look at the website for the Lost Gardens of Heligan. 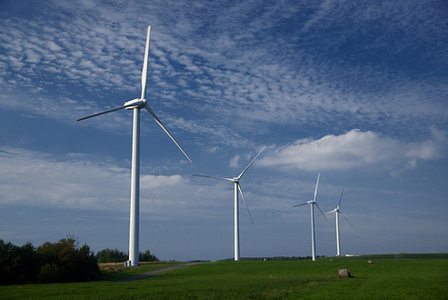 Driving to Cornwall on Saturday, near the road to jamaica Inn, I was amazed to see so many wind turbines on the skyline. In the brilliant sunshine they gleamed as the wings swung round in the breeze.